On October 19, the Fourth National Conference of the Russian Association of Wind Power Industry (RAWI) was held in Moscow. According to Ministry of regional development representative, wind energy development in Russia now is mostly depends of regional administrations. Climate change is also an additional argument for promotion of wind energy. 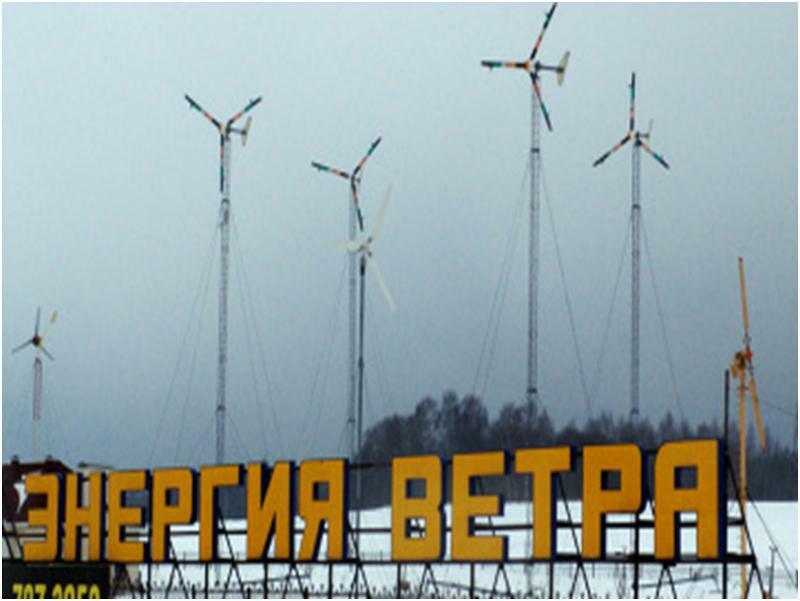 Now 12 wind power stations (WPS) in Russia are under planning and experts say about intention to build 30 WPS more. The conference was opened by Igor Bryzgunov, the RAWI President (also the director of "VetroOGK", an Atomenergomash daughter). He showed the map, according to which the preparatory work (site selection, wind measurements, feasibility studies) was completed for 12 wind farms during the last year in Russia. Such works are currently implemented for 4 more sites, and investors have announced the plans to build another 30 wind farms. Marina Shilina, the Deputy Head of a department with the Ministry of Regional Development, said that the Ministry considers renewable energy as a part of energy efficiency, and not an independent branch. It is not possible to definitely treat the Federal Law No. 261 ("On energy efficiency") in favour of renewable energy, everything depends on regional administrations. She also mentioned the qualification procedure for generation facilities based on renewable energy sources and believes that qualification shall be simply combined with the acceptance of the object. Pavel Bezrukih, patriarch of renewable energy sources (he worked on RES already in 1986-1990 at the Council of Ministers of the USSR), pointed out that regional authorities only in some regions support wind energy, while federal departments, to put it mildly, do not contribute. It is interesting to observe how the International Energy Agency (IEA) changes its attitude towards RES from scepticism to recognition. In 2011, global investments in renewable energy totalled 257 billion dollars (an increase of 6.8%). The capacity of solar photovoltaic power plants reached 70 GW (44% growth), of solar thermal ones - 1.8 gigawatts (37% growth), of wind energy - 238 gigawatts (more than the power of all Russian electric power plants). The ethanol and biodiesel production has ceased to grow. The IEA expects in 2015 (3 years from now) 790 GW of renewable energy capacity and 2,200 terawatt-hours of electricity (8.8% of world production of electricity). Russia is absent in global forecasts!!! The threat of deregulation of power systems because of rapid fluctuations in power production by wind and solar stations proved to be a myth. The stability of frequency can be successfully provided. Abroad, the conventional power sources do not get such huge state subsidies as in Russia. In a private communication, Pavel Bezrukih said that Russia shall take foreign technologies for wind turbines (except Chinese ones), and start with a portfolio of projects (and identify types of required wind turbines), otherwise it will be very easy to be in no demand. Hans Joachim Kopp from Roland Berger Strategy Consultants has shown a list of megatrends that impact investing. These are: climate change, resource shortages, demographics (population ageing), the responsibility of business, globalization, new technologies, and transition to the knowledge society. Such lists are a dime a dozen. New in the report was a map with the level of damage from climate change. Very strong damage is in the equatorial zone. Both tropical rainforests and savannas are heavily damaged. Prof. Seker from the Institute of economic, competitive and energy law in Germany and Europe talked for a long time about the ways to promote renewable energy at different stages of market development. His report would be very useful in our (Russian) distant future. Prof. Seker pointed out the cost of offshore wind energy. Meanwhile it is expensive, but it is expected that offshore wind energy will become cheaper. Elena Fedorova from RES Certification Department with the Market Council independent partnership described the procedure for qualification of generators based on renewable energy. The described procedure is so long and complicated that one of the listeners asked directly: “Why this qualification is needed, and why it is absent in the countries where renewables grow faster than in Russia?” This question was answered by Anatoly Kopylov, the Deputy RAWI Chairman. He said that abroad this is called certification. Certification is required wherever there is a subsidy. When Spain has certified solar power (purchasing power was subsidized by the state budget), it was found out that only 2,000 of 3,000 MW of solar power sources were real, and the rest 1,000 MW were fraud (cheaters sold regular power from the grid under the guise of solar energy). Paul Logis, who founded "Windlife Arctic Power" closed joint-stock company almost 20 years ago, told about his experience of implementation of an RES project in Russia. There are WORLD BEST natural and technical conditions for wind farms in the Kola Peninsula. These conditions have been studied in detail, the report thickness exceeds half a meter. The internal rate of return (IRR) is more than 20%. NEVERTHELESS: the wind farm project cannot obtain the necessary permits for 20 years already. Neither the sale of energy to "Murmanskenergo" nor its export to Norway succeeded. The investor, who is now 66 years old, said: "We are all small Martin Luther Kings." We believe that sooner or later, the Russian government takes all the measures envisaged by the legislation. " Yegor Grinkevich, the Deputy Director of the Department of Electric Energy with the Ministry of Energy, reported on a draft government resolution on measures to support renewable energy (the DRAFT has been already sent to the mailing list by Oksana Yengoyan). The project plans to introduce 11 GW of renewable energy of all kinds by 2020, within quotas (wind turbines, solar, tidal, small hydro, geothermal, biogas). Within the quotas for each type of renewable energy, tenders will be organized for the state subsidizing for 3 years ahead (in 2013 – for 2015). The form of the state subsidy will be payment for generated power. An additional condition is the amount of production localization. If the localization percentage is lower than the target one, the payment for power is reduced. I asked, if there are applications to create own production facilities for wind energy. Grinkevich answered “no”. Speakers from companies “Nord hydro” and "Altengergo” that passed all the challenges of qualification of generating facilities did not come to the conference. Andreas Thomas from Vestas company, a major wind turbines manufacturer, spoke about the company's projects. Listeners had many questions to him about the readiness of Vestas to localization of production. Vestas does not create industries in countries where it installs windmills, but in Ukraine purchased local towers for windmills. Thomas indicated the purchase prices for electricity from wind turbines: Denmark - 67 euros/MWh, Germany - 80-94 euros/MWh, Ukraine - 113 euros/MWh, Romania (green certificates) - 148 euros/MWh, Poland (green certificates) - 107 euro/MWh. Stefan Simon, the Director of the Department with the Corporate Energies company (Berlin), talked about forms of development of wind turbines production. Corporate Energies sponsored the conference. The company would like to get the order in Russia for conversion of a plant to production of wind turbines. Simon asked: "Please tell us who we can talk to in the Russian administration." Electricity must be consumed in the network of the European Community (ENTSO-E). Electricity must be generated by new facilities. Part of electricity must be used in a third country. The produced electricity shall not be the object of other support. Russia has great locations for installation of wind turbines, where the capacity factor is 40%. It should be remembered that the price of electricity in Finland is lower than in Russia. In this case, those who want to build an RES electric power plant shall choose one of the following: (a) Russian subsidized capacity payments, (b) measures to support exports to Europe, (c) direct contracts with consumers, bypassing network companies. Director of Activity Ltd. M.S.Badelin talked about the difficulties of selecting a location for installation of wind turbines and advertised his company as being able to cope with these difficulties. A. Medvedev, the Executive Director of "Industrial power machinery", a firm in Yaroslavl, told about wind-diesel power plants produced in Tutaev. The company sold 220 wind turbines (purchased and manufactured under license ones). Christoph Bauer (Lahmeyer GMBH) talked about specific features of planning wind-diesel systems in remote areas on the example of a gold mine Kubana in the Magadan region (700 km from Magadan). Wind atlas data and weather stations are of little help in making decisions about installing wind turbines. Wind measurements shall be performed during the whole year, which considerably cools down desires of private customers. Lack of roads limits weight and power of turbines. There are not so many turbine types that are suitable for transportation by trucks on winter roads. The company chose 14 275-kW windmills, each of which was placed in five 40-foot containers. With the price for electricity 9.1 rub/KWh, return on investment (ROI) was 12%. That is, installation of wind turbines in the Magadan region pays back only if the interest rate for a loan is at the foreign level. Sergei Gribkov, the Central Aerohydrodynamic Institute described development of domestic vertical-axis wind turbines with powers from 200 W to 30 kW. Production is still not broad-scale, so the price is more than $ 2,000 per kilowatt (without delivery and installation). According to Dr. Gribkov, small wind turbines are still dominant in the world. The average power of wind turbines is: in the U.S. - 1.24 kW, Great Britain – 2 kW, China - 370 W. However, 82% of small wind turbines are connected to the grid. Gerd Humel from SoWiTech International GmbH presented a project of 50-MW wind farm in Kurgan region. Igor Bryzgunov, the RAWI President and the director of "VetroOGK", made the following offer. VetroOGK has projects and land plots for wind farms, but no money to buy equipment. They are ready to co-operate with equipment manufacturers. Production of wind turbines in Russia has sense, but first the portfolio of orders shall be formed. It is necessary to be able to produce wind turbines for a given price that provides acceptable return on investment. Air freight transport (zeppelins?) is needed to deliver wind turbines to remote areas. Measures of federal state support to RES will be ready not earlier than spring 2013. Meanwhile, one shall look for direct private, municipal and regional customers. Comparison with the growth of heat pump installations in Russia by 40% per year (only the private market without any government involvement) shows that waiting for federal support is a sure way to ruin a business.